Vroom! That's the friendly roar of Wargaming's next entry in the war-vehicle niche, revving its engine in preparation for the cinematic battles ahead. 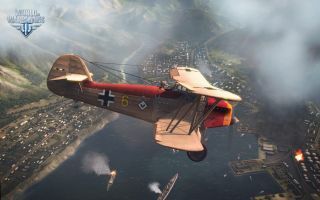 The studio announced today that its aerial combat MMO, World of Warplanes , now has a fixed date for open beta , with a trail of warplane screenshots scattered hopefully like breadcrumbs before us. World of Warplanes has been in various stages of behind-closed-doors testing for more than a year, but it finally enters open beta this July 2, debuting new features such as in-game tips and tutorials, crew skills, premium ammo, and two new maps. This is also the beginning of Wargaming's new Unified Premium Account , which includes covers warfaring sister-games World of Tanks and World of Warships. You can head over to the World of Warplanes site to sign up for your free access to beta on July 2; till then, enjoy this cast of planes from a pleasingly diverse range of countries.